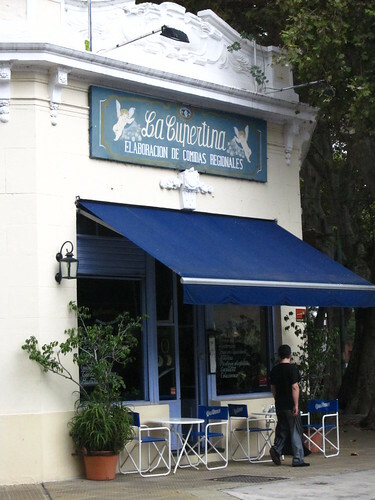 La Cupertina, at the corner of Cabrera and Godoy Cruz in the charming Buenos Aires neighborhood of Palermo Viejo, is reputed to have the best traditional Tucuman empanadas in the city. And, certainly, they are rather good. So tasty, in fact, that we bought a dozen for carry-out the day we left Argentina and nursed them carefully all the way back to our freezer in Brooklyn to enjoy nostalgically a month or so ago. Replete with savory pastry and chicken, cheese and beef humita (a stew of grated corn kernels, beef, hardboiled eggs, raisins and olives, but more about that in a later post) fillings, we were strolling arm-in-arm along the streets of our own neighborhood when we came across one of the glories of Brooklyn life: a selection of books put out for free on someone’s stoop. Among them was Así Cocinan Los Argentinos (How Argentina Cooks) by Alberto Vázquez Prego — a more timely find would be hard to imagine — and, of course, we immediately grabbed it. 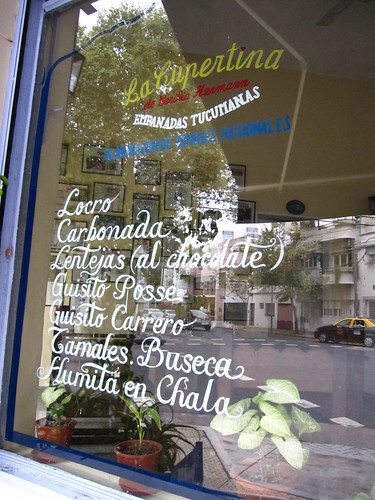 La Cupertina is also famous for other dishes from the province of Tucuman and, in general, its serious approach to the regional specialties from Argentina’s north and north-west — the areas bordering Paraguay and Bolivia — where stews of meats, potatoes, beans and other native ingredients are common. These hearty, one-pot dishes have much more in common with the endemic foods of the peoples of the altiplano (high plains) of Bolivia and Peru due to historic imperial ties to the Inca Empire which once extended south into modern-day Argentina than with the more Europeanized cuisine of the larger cities to the south and east. Nonetheless, many of them have been universally adopted as Argentine national dishes, emblematic of both the country’s aboriginal inhabitants and the creole (criollo) culture of the first Spanish settlers and gauchos. And, like other national dishes of South American countries, they aren’t the kind of meals that you can, or should, eat every day due to the lengthy preparation requirement and risks to long-term cardiac health. Similarly, there is rarely a single, unified recipe used by all cooks, only certain ingredients which must be included and others which are optional depending on how your mother used to make it and what is available. So it is with locro. 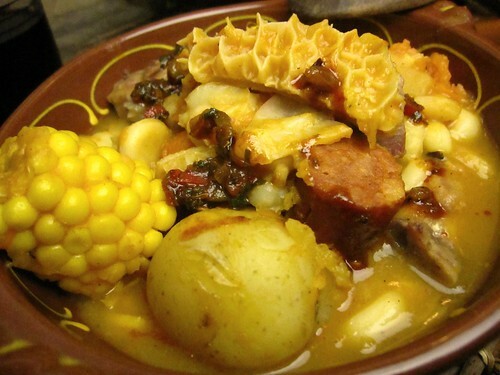 Deriving its name from the Quechua word ruqru, the origins of Argentine locro can be traced to the Andean region of Cuyo in western Argentina from where it spread across the country. Predominantly a winter dish (indeed at La Cupertina they only serve it April through November), locro is most commonly eaten on May 25 in celebration of the May Revolution of 1810 which kicked off the Argentine War of Independence. In basic terms, locro is a thick soup made by boiling the dry kernels of white hulled corn (hominy/posole) until tender and adding various meats and other vegetables to it. Indeed, what makes locro locro and not puchero or humita, or something else, is the hominy that, by the end of the lengthy cooking process, creates a thick and slightly sweet base. Locro can also be identified by what it does not contain, i.e. anything green. Leafy vegetables are shunned entirely by locro recipes — another reason, perhaps, that one shouldn’t eat it often. Aficionados of locro usually identify which of the many varieties it is they’re eating by the perceived emphasis on additional ingredients like pig’s trotters (patitas), squash (zapallo), bone marrow (huesos de caracú), chorizo, dry beans (porotos) or beef tripes (mondongo). However, this, of itself, can cause confusion, since some locro recipes call for several of these things. Any uncertainty in this regard, though, should not result in panic. After all, locro is a dish with broad shoulders, a reliable, sturdy presence, that once you get to know it — in all its forms — provides the kind of assurance that is so rare in this flimsy and transient world. This should not suggest that locro is a one-paced repast, steadfast yet insipid, dependable but dull — quite the contrary, in fact. For not only does it have many faces, but these are given a supplemental spark of personality by the addition of sofrito or quiquirimichi, a spicy, fried lard sauce that is used as a condiment, providing further reasons why Argentines might only eat it on special occasions. The recipe below, found in Así Cocinan Los Argentinos, and followed reasonably closely in terms of quantities, yields enough locro for a week of lunches of the kind that preclude productive afternoons. 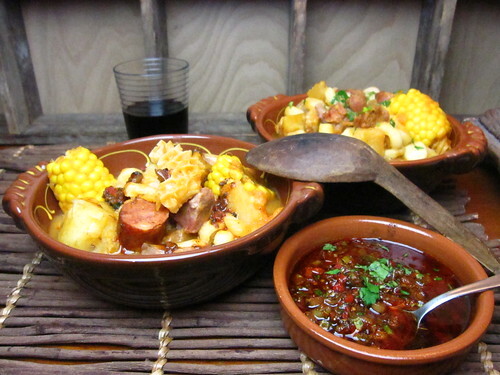 If you have a large family or are cooking for a block party, locro is probably the ultimate scalable dish as you can simply add more hominy, beans, broth and pig’s feet as necessary. It’s also great for those type of occasions because all the ingredients are inexpensive, relatively easy to obtain and create a wildly satisfying meal that your guests will be working off until you make it again next year. But, if you’re cooking for fewer people or simply don’t have a large enough pot for all this, you can halve it and still easily feed four adults. Wash hominy in cold water until water comes out clear, then soak dry beans and hominy (or giant corn) overnight (at least 12 hours) in lots of cold water. Bring 5liters (2 1/2 quarts) of water to a boil, and put trotters, bay leaf, lemon juice, 4 chorizo, and hominy (or giant corn) in it. Bring to a simmer and cook gently for 2 hours or until hominy is fluffed and tender. If pot starts to dry out, add more water as necessary. Simmer for 1 more hour, being careful not to let pot dry out or beans and hominy stick to the bottom. Add more water (but not too much) when necessary. Finally, add squash, potatoes and corn, and simmer it all for another 20-30 minutes, or until done. In the meantime, to make the sofrito (quiquirimichi) sauce, heat your lard (or oil) and add all spices, parsley and scallions to it and gently combine for five minutes on low heat. Do not allow scallions to get crisp. Season sauce with salt and pepper, and if you think it feels a bit thick, add a little water to thin it out. Season locro to taste with salt and pepper, and serve in large bowls with the sofrito on the side, and don’t worry about trying to make it look pretty. Well written and very interesting post. The only thing I’ve had of a definite South American influence that I knew of was milanesa from Ecuador, so reading this was educational for me. Thanks for taking the time to write it up. By the way, what a score to find that cookbook just begging to be put to good use! Definitely bookmarking this recipe. Very exciting flavor going on this stew. I bookmarked this and then I was inclined to share with my readers via my blog and social media outlets. This is a very well written and enticing piece…I am really hungry now and I am trying to find some places near me that serve this…. But it’s the tripe that makes my heart flutter. You’re just making words up now, aren’t you. Beautifully done! I spent time in Peru (drinking Argentinian wine LOL) but never made it to Argentina. 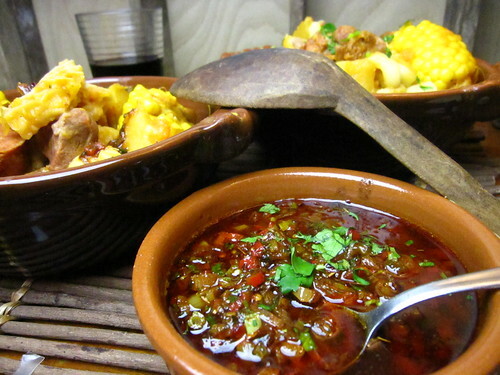 The corn, the potatoes, the warmth of a stew – all influenced by the criolla flavors. Looks amazing! mmm argentinian cuisine is one i have yet to try and everything looks very delicious. making me hungry! I needed to settle down with this. Top writing as always. This is clearly not for the faintheated or those with anything to do after lunch – me please. I noted that too fried lard sauce….classic. This is my kind of food! Big, hearty, full of flavor. Great post! That is some recipe! It’s a welcome relief from all of the Thanksgiving stuff. Thanks for the educational post. 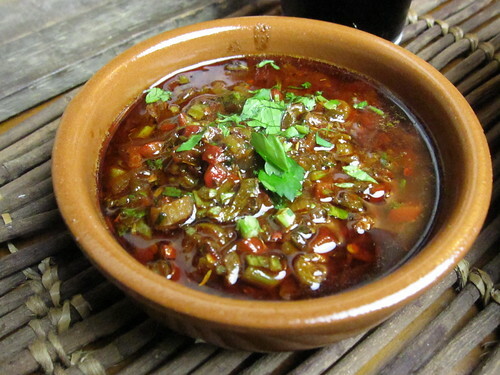 Locro de Mondongo… I love how it sounds :D. Only by saying it out loud you feel transported to a different exotic place. It looks like this dish could be the far away cousin of our Callos doesn’t it? This food looks amazing! I wish we had more Argentine food here in the U.S. I recall a place in Santa Monica years ago that had Argentine beef steak sandwiches- but this food on your post looks out of this world. Thanks for sharing! I’m thanking you for another reason. I have a simple locro recipe given to me by a friend a few years ago. Unfortunately, nothing in my notes talked about how to soak the maiz. I’ve tried using the soaking water (too thick) as well as draining and replacing the water after soaking (too thin). I just made a THICK batch yesterday, and am about to soak more for another batch I’m preparing tomorrow. I can’t wait to see how your technique works! One more thing–I’m hooked on the locro from La Cocina in Barrio Norte. Pingback: We Are Never Full » Blog Archive » Chocotorta: Can I Get An AMEN!? Pingback: We Are Never Full » Lentils with Chocolate. No, really.